When I was little I thought my dad was famous. Everywhere I went people knew who he was. It wasn’t uncommon for me to introduce myself to someone and have them respond, “Oh, you’re John Clark’s girl”. Until I was about 6 or 7 I basked in the glory of being celebrity offspring. It was glorious. In 1979 when I was four and a half my dad turned 54. We went to a HUGE party at the Cassady’s house. Everyone we knew from church was there. The Basses, the Millers, the Kearleys, the Williamses, the Womacks!! They were all wearing red, white and blue just like our family. There was a huge American flag cake, burgers and dogs, iced tea…. all for my dad’s birthday!! THEN, we went to Fair Park and sat in the Cotton Bowl and do you know they set off fireworks. FIREWORKS!!! All for my dad’s birthday!!! I was in first grade by the time I was brought down to earth. That is a story for another time, but I remember the 4th of July, 1982 when I was 7, finally realizing that all of the patriotic hoopla had nothing to do with my dad. It was just a coincidence that his birthday was the same day. I was crushed. Three years ago, while Teresa was still living in New Jersey Dad and I went out to see her over his birthday weekend. This may be my favorite picture ever. Teresa is an expert at the self photo!! We had sooo much fun this day and the entire trip was one that I will cherish forever! 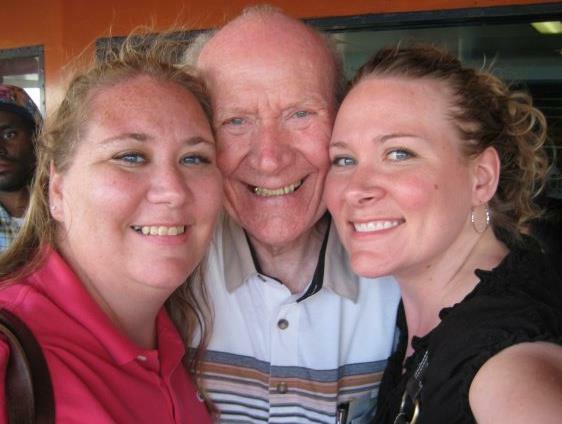 Happy 87th birthday, Dad!!! I love you and miss you tons! *also, happy birthday America!! 236 never looked so good.